Cast: Yoon Shi Yoon, Eugene, Jun Kwang Ryul, Jun In Hwa, Joo Won, Lee Young Ah and Jun Mi Sun. As she is giving birth, Seo In Sook (Jun In Hwa) is begging it to be a son, but when she gives birth to a daughter, her mother-in-law is criticizing and telling her, that she is a horrible daughter-in-law, because she can’t give the Goo family a heir. In Sook’s housebound, Goo Il Jong (Jun Kwang Ryul) isn’t much help either, since he feels disappointed in her as well. Some time passes, and In Sook goes to a furtune teller who tells her that there isn’t a chance for her and her houseound to have a son together. The only possibility for her to get a son is with another man, but her housebound will have a son with another woman. After a rough night at the office, Il Jong returns home, drunk, and ends up sleeping with a maid, Kim Mi Sun (Jun Mi Sun). This is seen by Il Jong’s mother, but because of her dislike of In Sook, she accepts it. When In Sook returns, Mi Sun is pregnant, and in fury she throws her out, and with the help of the department manager, Mi Sun leaves in fear. In Sook then, again with the help of the department manager, becomes pregnant, and makes everyone think its Il Jong’s son. Twelve years later, Mi Sun’s son meets Il Jong along with the son of In Sook, whom he thinks is his own. A lot happens, and Il Jong becomes fond of the kid, later finds out that it is his son. At the same time, Mi Sun’s son is befriending a girl, who he has had a crush on for a long time, and whose father beats her up, daily. Mi Sun then decides to leave her son, to live life easier, by living with the Goo family. But In Sook strikes once again, and Mi Sun is separated with her son, leaving her son wanting to find her. Twelve years pass again, and the 24 year old son of Kim Mi Sun, Kim Tak Goo (Yoon Shi Yoon) has become a gangster in order to find the man with the windmill tattoo on his arm, who is the man that kidnapped his mother. Destiny leads him to Pal Bong Bakery, where an employee has that tattoo. Tak Goo passes out after a fight, in front of the bakery, and is found by Yang Mi Sun (Lee Young Ah), the daughter of the head baker. But as it seems the son of In Sook, Goo Ma Joon (Joo Won) is taking the ‘baker exam’ at the very bakery, under an alias. Ma Joon’s hate for Tak Goo hasn’t changed over the years, and as Tak Goo’s childhood friend and first love, Shin Yoo Kyung (Eugene) pops up again, Ma Joon enjoys putting them through hell, but for some reason falls in love with her. Telling the truth, it’s good. 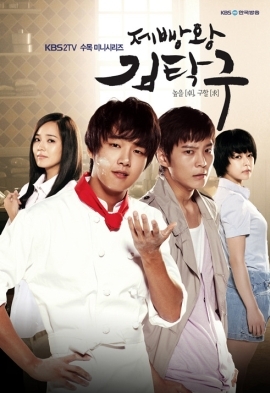 I rarely agree with the Korean ratings (this drama got a rating of 50,8%), but it really is good. If you look past some small causalities, like the fact that every one night stand leads to a baby and that you feel like shaking the villains and good guys because of their either ignorance or naiveness, the drama has a decent flow. I LOVE that the lead actress became so horrible (villain), and that the ‘evil step mom’ didn’t change in the end; those are the two most typical points in Korean drama, the lead actress is perfect and the biggest villain changes her ways in the end. I also love the way the supporting actor was, the fact that he was so afraid of getting hurt or looked down on that he made such a thick self defending shell, that no matter what he did, he would seem evil, even though I personally believe that it’s his wicked family’s fault. Every character had so much soul and were thoroughly made, that you enjoy every aspect of their being. I have to admit, it does have that choking feeling and ‘drainy’ as well, but personally, this is the first drama that made me jump off my seat, run around happily and not to mention cry. And 30 episodes are both too much, and too little; I was fed up with the trying of sabotaging of Tak Goo, but wanted more of the love stories and lives after the last incident. So I would recommend it, but if you don’t want your own feelings to be let loose, don’t, because it’s one of THOSE dramas, the ones you get irritated at, but can’t not watch it. I think I agree with all Bunji said, hahah, the drama is surprisingly good, you do get sick of all the people that time after time try to ruin Takgu's life and he just keeps fighting, but then again, it makes you go back and watch more and more. You leave it and come back all the time. It is actually a preetty terrible story, and I agree with Bunji, I liked the not so typical ending. There were a few things that were ridiculous, but hey it's a drama, and a korean one too. So yeah, quite good if you're up for 30 episodes of poor people being trambled on by rich people, and poor people fighting their way up, seeking revenge. It is quite good! Lol, first i check the ratings, then how many eps. when i saw it was 30 i though "never!" but i read ur review and i am actually, yup, considering it ! hahah! Lol, u know.. i do the same.. hah, wif urs tht is.. first rating, then ur oppinion.. i actually never read the first part..